A man works on a statue of the Buddha in front of his shop in Bangkok. 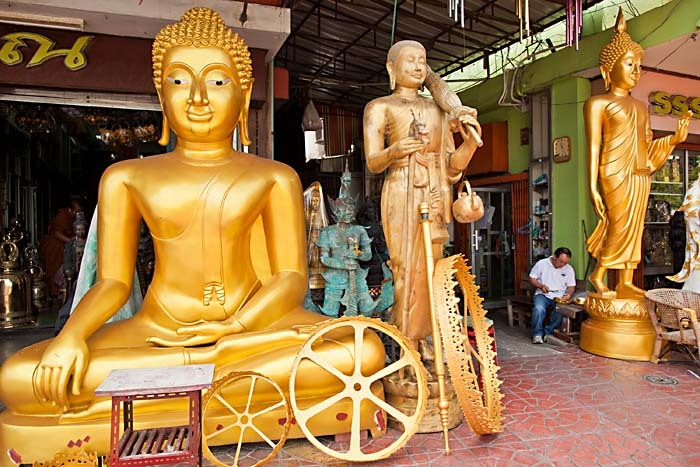 Bangkok, like many old imperial capitals is actually a city of artisan's neighborhoods. Although the city has gobbled most of them up, a few still exist, like Soi Baan Baat, where artisans still make the alms bowls used by monks on their morning rounds, or Ban Krua, a Muslim community that is renowned for its silk makers. Bamrung Muang Street is one of the city's hidden gems. It used to be the place where most of the Buddha statues and religious paraphernalia used throughout Thailand were made. It was one of the first paved streets in Bangkok, back in the very early 20th century. It was one of the first streets with something of a modern sewage and drainage system. Now the statue makers have moved out to the edge of the city, but Bamrung Muang Street is still where the statues are sold. I wandered up and down the street for several hours photographing merchants and customers, monks and nuns, all looking for the perfect Buddha for their home or temple. There are more photos in my archive or available from ZUMA Press.